You try your best to stay healthy this time of year by getting flu shots and washing your hands regularly. But don’t forget about allergies—fall can be the worst time of the year for allergy sufferers, especially those sensitive to ragweed. How can allergies affect your family? The air in your home can become filled with irritants a number of ways. Let’s say it’s your turn to throw the post-game party for your kid’s soccer team, or you’re hosting a gameday get-together with friends. In these situations, lots of people are moving in and out of your home, bringing with them allergens, dirt, and dust every time. This can jeopardize the health of your home environment and make the fall season uncomfortable for your family. 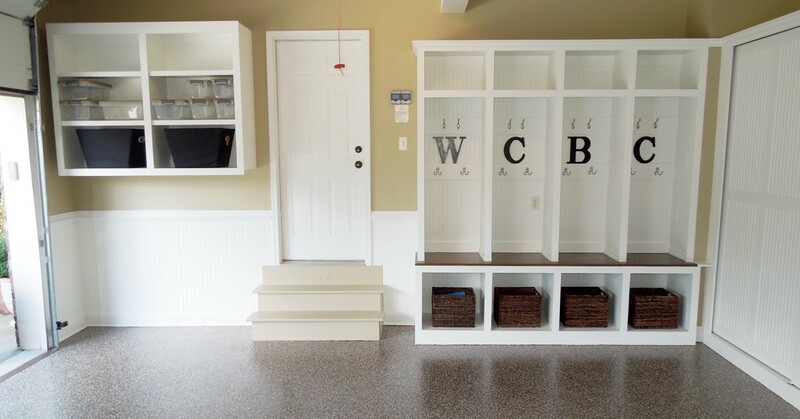 Putting cubbies or lockers in the garage is a great way to help keep unhealthy dirt and allergens outside – where they belong. Try out some simple steps to keep the air in your home fresh and breathable throughout the fall season. Common fall allergens like ragweed pollen and mold can stick to your shoes and clothes, especially after you’ve done yard work or other outdoor activities. One fall wellness solution is to set up a space in your garage to keep shoes and jackets. If you don’t have a garage, try to keep them contained in the front closet, and make sure to change out of outdoor clothes before moving throughout your home. This can actually keep your home more clean year-round. Dust is a nuisance any time of year, so it’s important to regularly sweep and vacuum all areas of the home to prevent asthma irritations. Mold is an even bigger concern in the fall, especially if warmer temperatures linger and prevent the first freeze from killing off spores and other particles. Old piles of wet leaves can quickly lead to mold issues that can be brought into your home, and other damp outdoor conditions can seep into your basement. Use a dehumidifier if necessary, and don’t allow wet garments to sit for long periods of time. Using an air purifier is a great way to keep your home healthy and improve fall wellness. Whole-home purifiers can remove allergens of all sizes (including ragweed, mold, dust, and more), and it’s all done in the background using your preexisting heating and cooling system. Plus, Aprilaire air purifiers can be controlled and programmed with your phone through our Wi-Fi thermostats. This allows you to schedule air cleanings after you host an event or if allergy counts are particularly high, helping to keep your entire home environment consistently healthy.